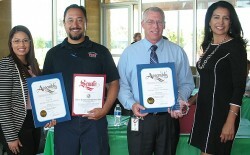 Code Inspection Officer Jorge Self and Fire Services Coordinator Greg Schreiner hold up the Fire Authority’s Agency Award and letters of recognition for their service with (at left) Aida Castaneda from Assemblywoman Lorena Gonzalez’ office and Lori Brown from Senator Joel Anderson’s office (at right). SAN DIEGO–More than 200 properties in the East County are better prepared for this fire season after a landscape service went in and cut defensible space around the land at no cost to residents. The work was done in the spring in the communities of Julian, Whispering Pines, Kentwood-In-The-Pines, Harrison Park, Pine Hills, and Santa Ysabel as part of a joint project between the San Diego County Fire Authority and the Resource Conservation District of Greater San Diego County. “There was no charge to the community members and we were able to do this work because of the funds that the County gave us,” said Sheryl Landrum, district manager for the Resource Conservation District, whichmanages programs and funds for the Fire Safe Council of San Diego. “This work is so important in the County.” Last week, the Fire Safe Council, a nonprofit agency promoting fire prevention and management, presented the Fire Authority with an Agency Award for providing exceptional service within the community with this project at its awards luncheon in Bonita. “I think we really have made great strides in helping the communities become better prepared for wildfires,” said Kevin O’Leary, Fire Authority Fire Services Coordinator. “From a firefighting perspective, anything you can do to get residents to create defensible space makes the community safer.” In addition to helping those property owners, Landrum said the Fire Authority’s grant funds also helped them put on four community workshops on maintaining defensible space and community preparedness, two community wood chipping days, and cleared and chipped dead, dying or overgrown brush on 1,735 acres. The Fire Authority used a U.S. Forest Service grant to fund the program. One of the program recipients, Linda Peterson of Pine Valley, sent a letter to thank the Fire Safe Council, which coordinated the program: “All parts of this program are well coordinated and work smoothly and efficiently. It is a much needed service in our area, which many homeowners cannot afford if provided privately, so (it) usually goes unchecked. Thank you for a great job done and a good use of our tax dollars.” Two Fire Authority employees, Fire Services Coordinator Greg Schreiner and Code Enforcement Officer Jorge Self, were also recognized for their efforts to keep the region fire safe. Schreiner, who also serves as the County Fire Marshal, runs the prevention division, and works with Self. Both serve on the Board of Directors for the Fire Safe Council and recommended the partnership to the Fire Authority, Landrum said. Formed in 2008, the Fire Authority provides support to 15 rural fire agencies, including nine volunteer stations, and extends round-the-clock protection to 1.5 million acres in the unincorporated county that previously had part-time or on-call emergency service. The Fire Authority provides fire prevention information to residents, and assists rural fire agencies with staffing, equipment, apparatus, and facilities.